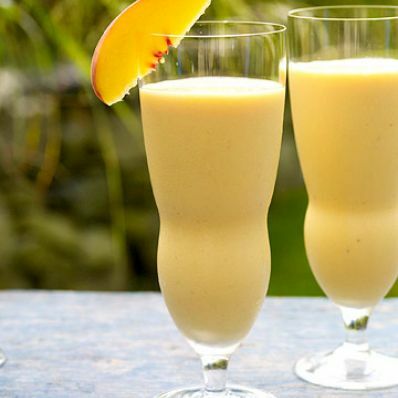 1 of 1 In a blender, combine ice, peaches, milk, yogurt and juice. Place lid on blender and select mix or crush setting. Blend until smooth; while machine is on, pour in honey and blend an additional 30 seconds. Pour into glasses and serve. Per Serving: 2 mg chol., 18 g carb., 1 g Fat, total, 1 g fiber, 30 mg sodium, 4 g pro., 0 g sat. fat, 89 kcal cal.